The reason of everything is an “embroidery”. In the course of our lives we are weaving our experiences, our yearnings, dreams, failures, joys,…, and, at the end, we only see the framework, even the knots, but we forget to turn around the tapestry… we invite you to turn it and to see the “embroidery” of our lives. 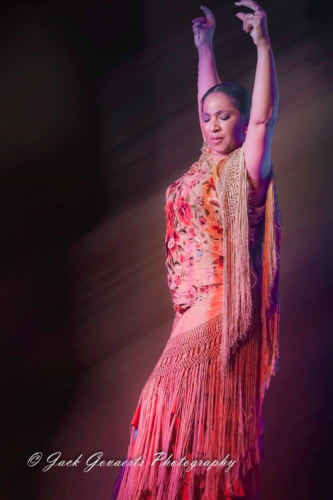 Elena Andújar got her degree in Spanish Dance and was an advance student at the school of Matilde Coral. During her artistic career she was accompanying choirs for Pata Negra, and was part of Joaquín Cortés’ company in the shows Cibayí and Pasión Gitana. She has collaborated with very important musicians such as Jorge Pardo, Carles Benavent and Peret. Carrasco is a very experienced guitarist, who started playing when he was 9 year-old in the peña flameca Chacón. Years later he worked in different festivals and peñas with artists such as Luis Pica, Fernando and Curro de la Morena. He played in different tablaos like Café de Chinitas, Casa Plata y El Arenal. At the moment, he is accompanying Juan Ogalla, Manuela Ríos, Soraya Clavijo y Almudena Serrano.